We're climbers! Adam Gaulin, rock climbing enthusiast, started Rope-A-Dope in 2007 when he realized he can go where few else can in Calgary! Adam is a Level Three Sprat Certified Technician, and a leader in rope access, work at height safety, and technical expertise. Window cleaning and building maintenance in Calgary are competitive industries, and Rope-A-Dope leads the way by continually refining techniques and methods. Our team is highly trained and highly experienced. 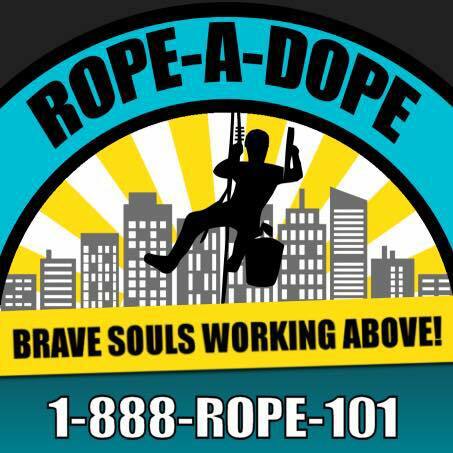 Experience why Calgary's most prominent builders and most recognizable structures work with Rope-A-Dope for all their window cleaning, building inspection, and building maintenance needs! Are you the owner of Rope-A-Dope Windows Inc?